When you ask a random American if they know Curaçao, most will have never heard of it. If you then ask them if they know Blue Curaçao, they wholeheartedly answer yes. So does Blue Curaçao really come from the island, why is it blue, and who started it? This must be one of the bigger mysteries surrounding one of the most famous liqueur names in the world. So first, we have to start by explaining what Curaçao is. Well, Curaçao is a tropical island in the Caribbean Sea, 60 miles off the coast of Venezuela, right next to Aruba. 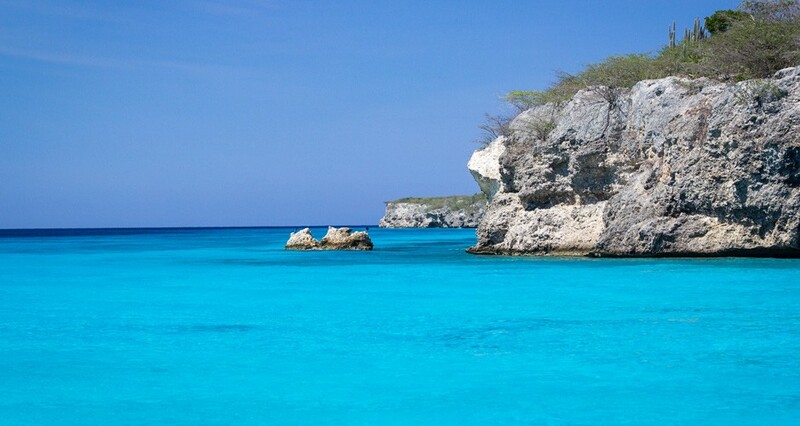 Curaçao has a dry but sunny climate, with great weather to enjoy almost year round. It is surrounded by beautiful clear blue and turquoise water. The island has a colorful character. Houses are painted in various bright colors, making the capital Willemstad one of the most photographed inner cities in the world. So how come they have a famous orange liqueur? A couple of centuries ago, the Spanish had control of Curaçao and they tried to make money through agriculture. So they tried to grow the Valencia Orange. But this sweet orange couldn’t handle the constant sun and dry climate and it became bitter, inedible and even turned green. This orange got the name “Citrus Aurantium Currassuviensis”, meaning the “Golden Orange of Curacao”. Why golden you ask? Because when the orange is ripe to be cut, it gets a golden color on top. In the local tongue, they called the orange Laraha. They started making etheric oils out of the Laraha peels, and at one point even a liqueur. That was the birth of the Curaçao liqueur. Actually, for Curaçao liqueur to be official it has to be made with the peels of the Laraha. Now the mystery begins. It seems like somebody thought it was nice to have multiple colors of Curaçao: white, orange, blue, red, and green. Who the person was that started this, is still unknown. References of the different colors for the Curaçao are found from the early 1920’s. Curaçao liqueur is often used in cocktail recipes as a sweetener. We assume that the colors were invented to create a coloring agent for more attractive looking cocktails, without changing too much of the taste of the cocktail. Nowadays, you will also see that many colored Curaçaos have a lower alcohol percentage than a regular Curaçao liqueur. The color blue always was a front runner. We think because it evokes thoughts of a tropical vacation with beautiful blue oceans and blue skies (there is mention in the 1930’s of a Dutch style Curaçao version called ‘Crème de Ciel’, French for ‘Cream of Sky’). Another reason for the blue is that a cocktail simply looks stunning with some blue coloring in it. It is candy for the eye, which makes the cocktails much more attractive and an easier sell. In the 1960’s, Blue Curaçao started to become really popular around the world. Probably because Elvis Presley released his movie Blue Hawaii, which is the name of one of the most popular blue cocktails. Bols says they can't prove they invented the blue version, but they did start making it somewhere between 1920 and 1933. It wasn’t until the 1960’s that Senior liqueur started having different colors for its Curaçao liqueur. But being a liqueur brand from the island of Curaçao, we are extremely proud of having the strong connection with Blue Curaçao. Primarily because of the Laraha orange, but also because of the oceans surrounding us, and the sky above us, that feature the most incredible blue hues you will ever see.